DEADWOOD, SD – A love of country and seeing a need to reach out to those who serve has led Montana rancher Jerrid Geving to open the Sacred Mountain Retreat Center near Deadwood, SD. An ever-rising suicide rate among both veterans and first responders calls for action – not just by agencies - but by individuals and communities as well, says Geving. Sacred Mountain Retreat Center is a 10,000 square foot lodge located off Highway 385, outside of Deadwood that sits on 65 acres, bordered by Forest Service on all three sides. There are eight bedrooms in the main lodge, as well as a one-bedroom suite. 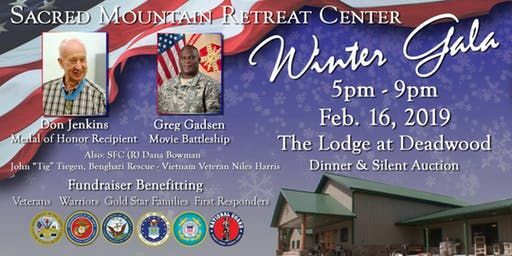 A fundraiser to benefit the non-profit center is set for this weekend at The Lodge at Deadwood where Geving says honored guests, speakers, veterans and first responders from all over the country and supporters will share a commitment to bringing something more to the table for those in need. “For men and women who are serving on the front lines – either here or abroad – their traumatic experiences are something civilians just can’t understand,” shares Gevin. “Many struggle being able to move through such experiences – which leads them to isolation; from friends, families, and life in general. Not the least of which is its location. Dating back long before white settlement, indigenous peoples inhabited what they called Paha Sapa or He Sapa. The area was considered (and still is) as a sacred place; a place of prayer, offerings and healing. It’s in these surroundings where Geving says the process of acceptance and a rekindling of spirit can begin. Once placed, veterans, first responders, Gold Star and Thin Blue Line families will have the services of trained physicians, therapists, and support staff available to them. As part of the center’s program, re-introducing veterans and survivors to social environments and people is an important part of the process. He is especially excited about the Center’s therapeutic equine program – a form of treatment that has proven especially effective in helping teach skills related to dealing with various forms of trauma. The Center’s Winter Gala on February 16, 2019 is designed to raise funds that are used to provide travel, lodging, food, and activities at no cost to veterans, warriors, soldiers, first responders, Gold Star and Thin Blue Line families. The evening includes dinner, a program, live and silent auctions and entertainment. Speakers at the event that gets underway at 5:00pm include Don Jenkins, Quality, KY, a former Army Staff Sergeant during the Vietnam War and Medal of Honor and Purple Heart recipient, Niles Harris, Deadwood, a member of the 173rd Airborne Brigade during the Vietnam War and the inspiration behind the hit country song written and recorded by duo Big & Rich “8th of November,” Colonel Gregory D. Gadson, Chesapeake, VA, a 25 year career Army officer who has served in every major conflict of the past two decades and who lost both legs and has restricted use of his right arm and hand in an IED attack, and former Marine Sergeant and Infantry Squad Leader John “Tig” Tiegen from Colorado who would also serve on the CIA’s Global Response Staff during the Benghazi attack that killed four Americans. Tickets are available through Evenbrite.com or by calling 406-891-0024. Individual tickets are $75, a table is $600, and a VIP table is $1,200.